This IPC Eagle 32 inch ride on floor scrubber is a industrial rated compact version of the IPC Eagle line of automatic rider scrubbers that we carry. It comes with a 29 gallon solution tank that can scrub a huge amount of flooring in a small amount of time. It is also compact enough to turn on a dime and scrub narrow aisles and hallways. We have received great feedback from several grocery stores and large retailers like Target and Wal-Mart that this machine does a great job of quickly cleaning their stores. With a max productivity rate of 27,000 ft² per hour, and a max run time of 2 hours, you can scrub a 80,000 square foot facility on a full charge. That is an extremely large area! The 24 Volt 240 Amp hour (4 x 6 Volt) batteries that come standard with this automatic scrubber can be swapped out for AGM batteries, and other configurations. Please give us a call if you are interested in pricing for any type of customization on this machine. 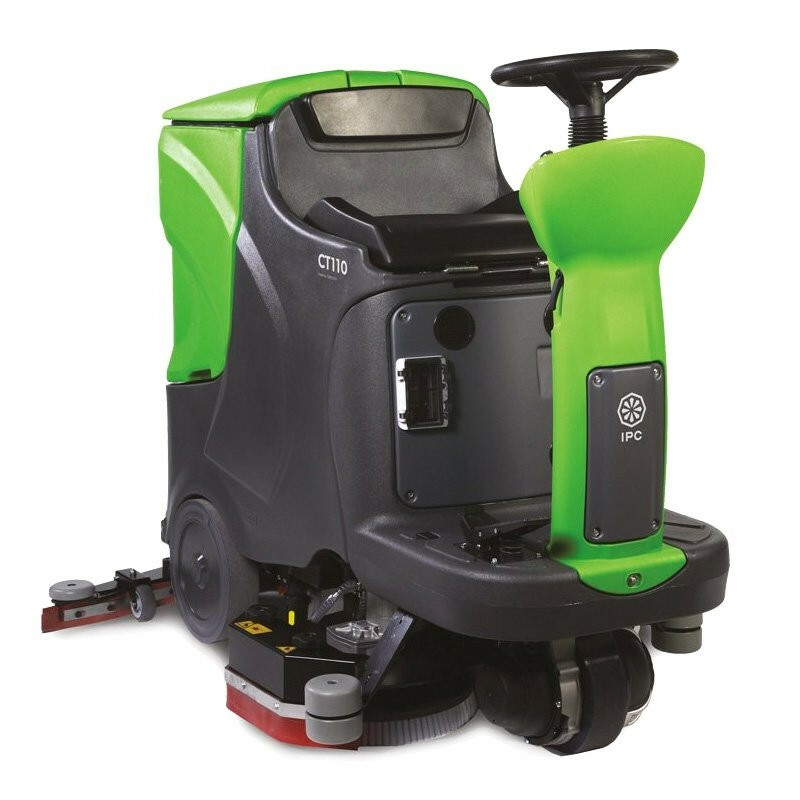 When cleaning with the CT110 auto scrubber, it can be fitted with several different configurations of brushes and/or pads to scrub lightly, extremely aggressive, or somewhere in between. It can also be used to strip your commercially tiled floors. Leave the squeegee in the up position to double scrub those heavily soiled areas, or to strip large wax build up off your floor. This IPC Eagle CT110 rider scrubber ships for free to any location in the continental United States! If a ride on floor auto scrubber isn't quite what you're looking for, we also offer a great selection of smaller, less expensive rotary floor scrubbers and walk behind floor scrubbers. Not sure what kind of auto scrubber is right for you? Please give one of our cleaning experts a call at 1-855-242-9029 for a recommendation for what machine might be right for you needs, and to answer any questions you may have. Large solution capacity in a minimum external space. Extensive running time, large battery compartment. Solution control with automatic stop. Battery level indicator for run time awareness. Recovery tank can be tilted for cleaning, and the discharge hose is located at it's maximum height. AFS (Anti Foam System) and shut off sensor to protect vacuum motors. Squeegee blades can be used on 4 different sides before replacement.